Presently, more than 0% of all goods are transported by trucks. However, those trucks are often subject to road traffic, accidents, and inclement weather. Iron County has a long history of railroad service, dating back to the early 1920s. Today, with the partnership of Port 15, Cedar City boasts the largest, new rail-served business park in the Western United States. Cedar City’s 21-mile branch is a transportation asset that is maintained by Union Pacific. This railroad is also utilized by all of Southern Utah, Southern Nevada, and Northern Arizona, making rail an optimal choice for the transportation of goods to those areas. 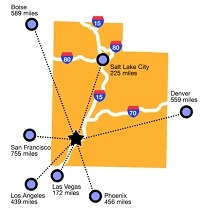 The I-15 corridor is a primary highway system connecting Montana, Idaho, Utah, Nevada and California with access to other major Highway systems including I-40, I-70, and I-80. Over 8 million travelers pass through Iron County on the I-15 corridor each year. Iron County is accessible to 48 million people or 86.5% of the western metropolitan population within one day's trucking. The Cedar City Regional Airport maintains a 10,000-foot runway and is the most convenient airport for travelers visiting Cedar City, Brian Head, Bryce Canyon National Park, Zion National Park, and Cedar Breaks National Monument. The Cedar City Airport is within one mile of downtown Cedar City and is served by Delta Connection. The airport itself is the second largest airport in the state. In fact, if necessary, a Boeing 757 can land there. The airport provides access to travelers coming from around the world to witness Cedar City's beautiful landscape and the surrounding National Parks. Further, the Cedar City Airport is utilized for businesses to transport individuals and products to help provide them with their business needs. For more information regarding the airport, please click here. Cedar City Inbound and Outbound rate comparisons show low competitive rates for the western markets. This dashboard, created by Modalgistics, provides insight into how Cedar City inbound/outbound rates compare to those in/out of nearby transportation hubs.